Note – browser and computer screens display colors in different ways. If you look at these images and think I must be color blind because my descriptions are way off, please consider that the color display may not be accurate. In fashion, color stories are themes that designers and retailers put together to tell a story, but in colors. If a collection has a military theme, the color story will most likely be something like brown, khaki, and army green. If a collection has a summery island get-away theme, the color story will most likely be something like turquoise blue, emerald green, and sun-kissed orange. 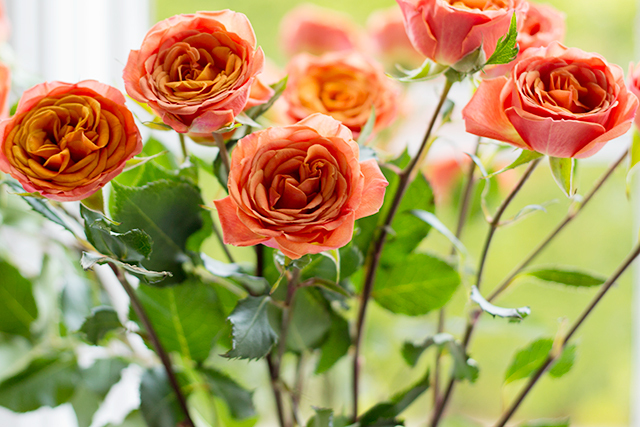 The colors will mix and match well with one another and set a certain mood. Now let’s relate this to my wardrobe. Part of the reason I got fed up with my clothes was…nothing ever matched! I would go shopping and fall in love with items in a dizzying array of colors, but when I got them home, nothing went with anything else I already owned. I didn’t have a color story…I had a rainbow, and no idea what to do with it. In an effort to build a more cohesive wardrobe, I started paying attention to the colors I really liked wearing, and bought future items in those colors, as well as the colors I thought mixed well. Notice how the saturation of these colors are very similar. I find it easier to match colors of a similar saturation (dark with dark, light with light), so for my wardrobe, I tend to focus on darker, saturated colors. Now, don’t think those are the only colors I buy. I buy other colors, but in smaller amounts, and I consider if they’ll go with my basic color palette before purchasing. So…how do you choose which colors to pick? So, if one of your favorite colors to wear is blue, look at the colors right next to blue on the color wheel. Green and violet will mix well, as well as the in-between colors of blue-green and blue-violet. Stock up on those colors in a variety of clothes and accessorizes, and then you can mix and match with your favorite color much easier! Complementary colors have the most contrast to each other, and can be a bit shocking when paired in large amounts, like color-blocking. Examples of complementary colors are the red and green associated with Christmas, and almost any sports team jersey (like yellow and purple…go Lakers!). 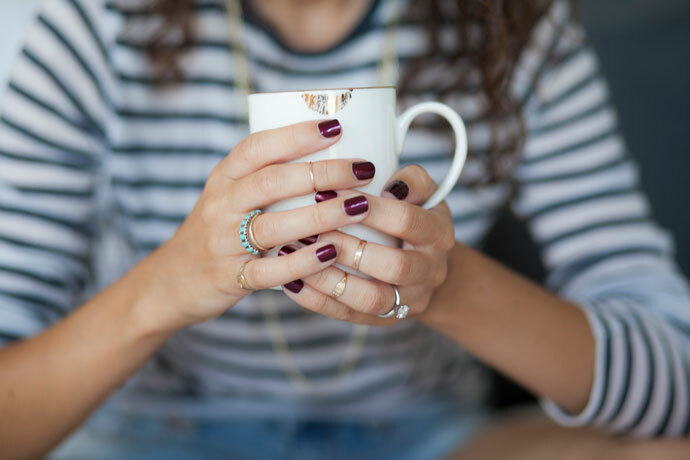 Unless you’re a color mixing pro, I’d stick to pairing complementary colors in small amounts, like jewelry, for a “pop of color” to an outfit. So, if one of your favorite colors is blue, and you want to add “pops” of color to your outfits, look at the complimentary color, orange. One of my favorite color “pop” pairings is turquoise (a shade of blue-green) and coral (a shade of red-orange). Dressing all in one color can be pretty boring, but not if you do the same color, in a variety of tints and shades. Things that are cold are usually blue, green or violet (like water or grass). Seeing these colors remind of us of things that are cold, so those colors are called “cool”. Looking at cool colors can make us feel calm, relaxed, and cooler. This is why a lot of doctor’s offices are painted blue! It’s certainly red, but it’s not a crazy bright, flaming red. The color is toned down by a little bit of blue in the red color, which makes it a little darker and “cools” down the red. 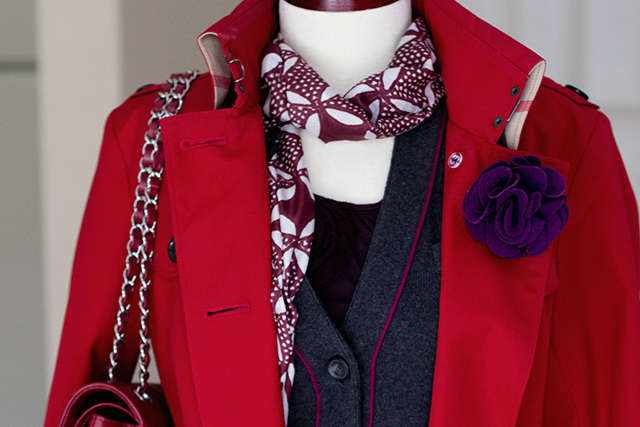 This “cool” red is now easier to pair with cooler colors, like purples and blues. – Color can be very subjective, and everyone views colors and those that are pleasant or beautiful together, differently. Wear the colors that make you feel good and beautiful, regardless of what’s in “fashion”. – Are there colors that people tell you look great on you? Stock up and wear them near your face, like blouses and scarves. – Do you love a color, but it’s not a good color for your complexion? You can still wear it, just wear it away from your face, like in a skirt, handbag, shoes or belt. 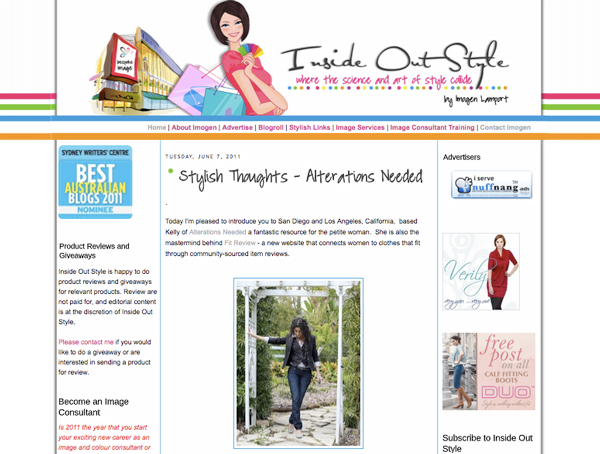 – Need color inspiration? I love the site Wear Palettes, that organizes outfits from Lookbook.nu by their colors and gives you a handy color palette for each one. 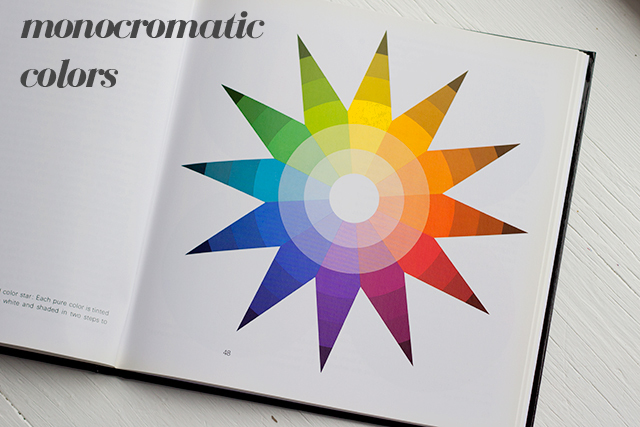 – Advanced color user? Kileen over at Cute and Little hosts the Color Brigade. Does your wardrobe have a color story? Maybe that’s why I like your blog—you have the same color taste as I do. My closet is largely full of those exact colors. One of these days I would like to buy more yellow-orange shades, but it’s tricky for me to find the right shade. I also rarely wear pastels. I think in general saturated colors are more flattering—although sometimes I see a pretty, bright pastel, like mint green. I think my love for color came from doing a lot of gardening at a young age. I definitely dress according to my mood, and the colors usually match my mood. I can’t wear gray though, at least not near my face. I love your gray Cole Haans, though! This is a fantastic blog entry–I certainly haven’t thought of my wardrobe in these terms before. I don’t think I have a general color scheme, but I do know there are colors I don’t have or stay away from (orange and golden yellows, for example). 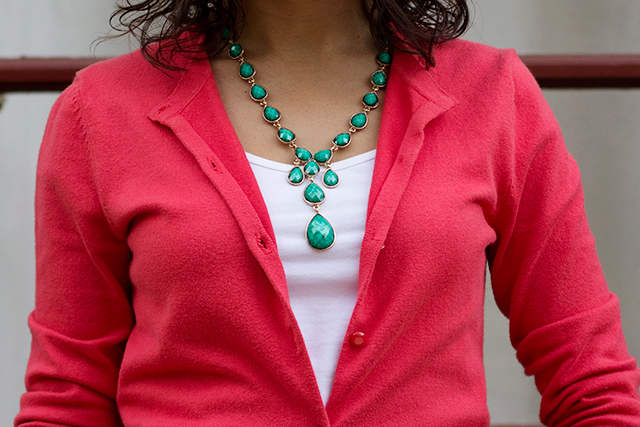 I love pairing corals with turquoise (I actually did it in today’s outfit–post later tonight!) and navys with yellow and I recently paired an olive green dress with purple. I suppose I’m best at mixing complementary colors…but I never saw it that way. Thanks for sharing! Thanks Whitney! 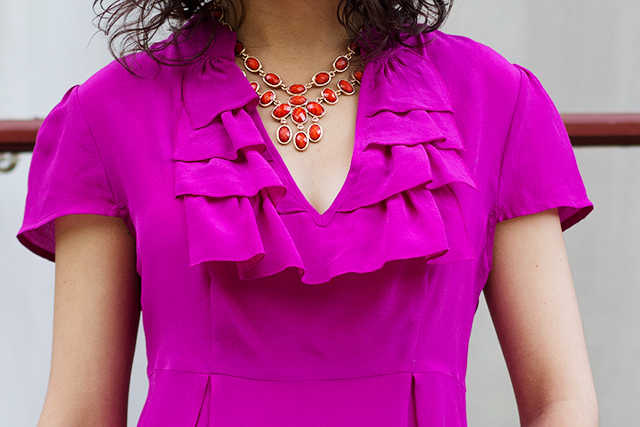 I hope you can find some more fun color pairings in your closet now. This is SO useful and clear – thank you! I adore coral and jade too and never really understood why til now! Thank you!! Ah, yes! Coral and Jade are beautiful complements! This is a great post! I just realized the other day that I have NO red in my closet. I just started picking up a couple purple pieces, but I have have tons of blue. I’ve been trying to incorporate brighter colors in my wardrobe this summer – mostly because I love the color blocking trend. I’ve mostly been pairing analogous colors – I have another post going up later today with an analogous pairing. Bright shoes are great because they have some distance from the rest of your outfit (all the way at the bottom of your feet), so they can be a little more outrageous. My bright red shoes are my favorite to pair with plan black or white outfits, so I bet your pink shoes are fantatstic for that as well! I’m loving color now that I have some to play around with! so educational. I learn so much from this blog. wanna know what I don’t like to wear? Colors that remind me of holidays. So I’ll try my best to fight against wearing green & red, orange & black, red & pink, etc. Black and red also reminds me of a Hot Topic kind of thing…just very high school-ish to me. And goth…which is probably why I think high school. Love this post! I love complimentary the most. Great tip, especially the third. I was just talking to my mother-in-law about colors while shopping today…there are some that I love but do not think look good on me, so I like to buy accessories or bottoms in that color. Btw…so many cute things at J. Crew today…I was thinking of all the blogging ladies! I was birthday shopping for my husband, so I did not shop for myself much…just found a super discounted skirt for work. Wow! Great story and very helpful resource – perhaps I should go through my closet and start paring down!! Great Post! I have to admit..Thanks to you ladies and the blog.. Im crossing boundaries (in a good way hopefully, LOL!) when it comes to dressing up… Pairing stuff Ive never done before and definitely more aware of what actually looks good on me rather than what I think looks good on me! Some people are lucky to inherit a natural eye for color, and I’d say you’re definitely one of them! I’ve never been a very creative person (I worked in science for pete’s sake! Talk about non-creative! ), so it always helps me to see the “science” behind creative things to get my feet wet. I think I’ve developed an eye for color recently, but I’m still uncomfortable with more daring color pairings. 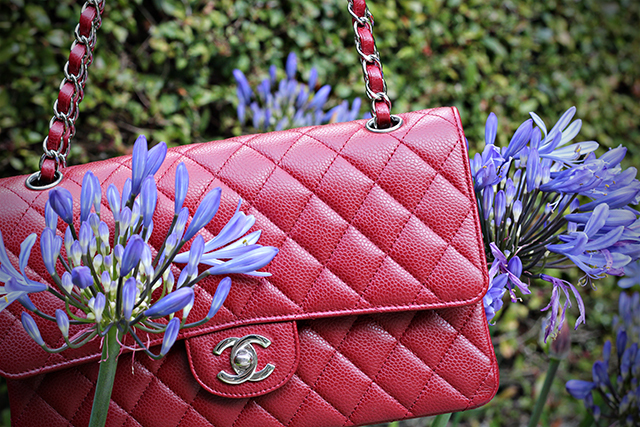 I’ve identified AlterationsNeeded with red ever since I started reading years ago (maybe it was that lovely red Burb trench hmm, followed by the luscious red Chanel). I loved reading about color theory in this book my bf’s mom gave me because it made me realize pairings that I would never come up with on my own, like analgous colors. These color combos are now some of my favorites! And oh…our fuscia br silk top is an oldie but goodie…I just wish it didn’t flare out so much at the bottom so I can shove it into pencil skirts! 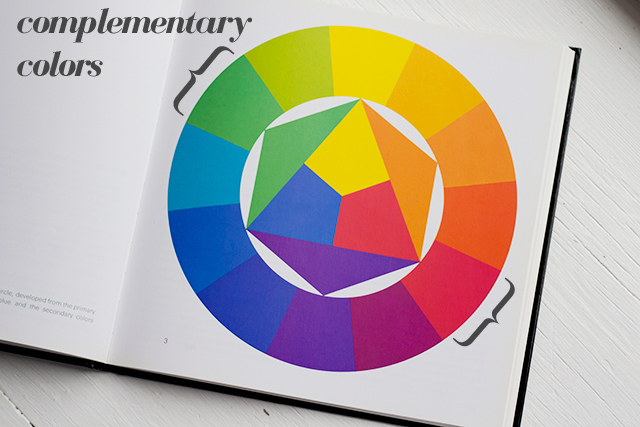 You would really like a color theory class! I took a cheap summer course through a local community college for fashion undergrads. Our teacher was kooky & wore crazy art-teacher outfits, which made it even better. wow, this is so clear and simple. I always despair that my clothes don’t match – and the funny thing is i am a painter, so i know these colour charts very well. I just never think to use colour theory in my wardrobe. this is such a great post and very helpful for people who don’t wear a lot of color. and thank you so much for the shout-out! Blue is my favorite color. Periwinkle is a good color on me, and my wardrobe tends to reflect that. I’m an LA girl, born & raised…gotta love the Lakers! LOL! this post is AMAZING, kelly! so well thought out, beautifully written and super duper informative! i feel like i just finished reading a research article, but a really fun one haha. thank you! Thank you!!! I guess that’s the science nerd in me coming out. We love “researching” things. LOL! I’m with you – I love, love, love deeply saturated colors and jewel tones. I linked to this post on my blog recently. It is so well done and helpful. Thanks! This is the most useful guidance I have come across re: using colours to create a cohesive wardrobe. Thank you!